Since the age of time, water has always been part of a vigorous debate: does pure water have a flavor? 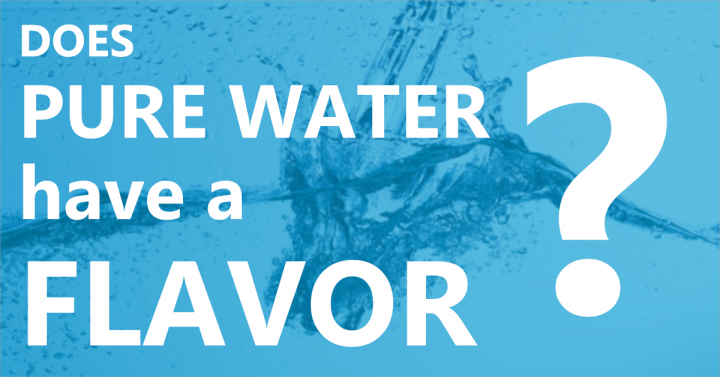 Notwithstanding personal taste, water’s flavor is undoubtedly a question of perception as well as reliance on external substances that impact its overall flavor before you consume it. Water is a natural solvent and substances that will be in contact with water molecules (two molecules of Hydrogen and one molecule of Oxygen) will alter its taste. In effect, water is only as pure as its proximity to its root source or following a three-stage filtration process. First, let’s define what a flavor is: the aggregation of smell and taste. For example, the addition of chlorine, to disinfect its content will add to its aroma and taste, compared to if water were being consumed right after a three-stage filtration process that eliminates the smell and taste of chlorine. It is quite recently that researchers found that pure water tastes something. Indeed, Zocchi, Wennemuth et Oka have identified that water is sour. These researchers have analyzed the response of acid-sensing taste receptor cells on the tongue of mice when drinking water. To achieve this, they used a technic called optogenetics to stimulate the sour cells on the tongue with light instead of water. In sum, they suggest that the perception of water drinking is an internal process. Mice, and so do we, have internal sensors that help with the knowledge of water consumption. Now you know that pure water has a flavor. This flavor is a function of taste and smell. Overall water flavor will be influenced by substances dissolved in it before its consumption. Therefore, you can modify its flavor by using a three-stage filtration process, for example, to eliminate the smell and taste of chlorine with the KCP Carbon Filter.